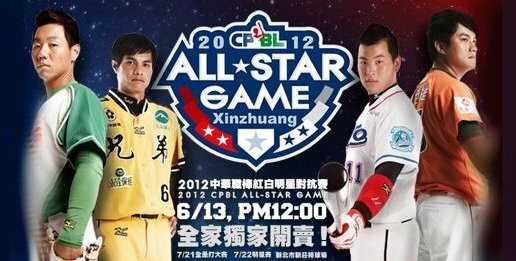 It all begun when I saw this promotional poster online featuring the upcoming Taiwanese' CPBL All-Star Game (top) and instantly it drawn my comparison with the photo featuring the "SuperGals" (as issued by the league authority weeks ago). A random gauge around and I asked if these two posters are being placed side-by-side which of it is likely to gain that "instant attention". Not surprisingly, the words "ALL STAR" stood in between the sluggers immediately caught the attention of those who responded. Natural instinct would make one to take a closer look at what was the CPBL poster is talking about, rather than those ladies. Using similar concept, I made use of "Halftone", one of the many available apps on my phone to come up with a few "Support Our S.League" posters of my own (nothing wrong with that since it's not a trademark belong to anyone) and share them online. I am glad that the feedback has been positive and appreciate those who had share them via various means with the others. While I don't expect many would think the same way of doing this kind of posters. Nonetheless, what I want to bring the message across is - it's not just only a matter of how much one is going to spend in maximize the awareness, but ultimately one need to figure out the best effective way to bring the message across without bursting the budget. - The "Less-Than-$2" posters were from this album and due credited accordingly. Also I think that they should try something different. There are many way that they can profit with local soccer players.